It’s been a big year for AutomateWoo! 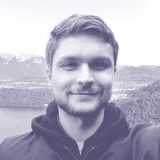 As you’ve probably heard AutomateWoo joined Prospress in June! I’m excited to finally announce that AutomateWoo 4.4 is shipping this week! This release adds powerful new ways to segment your workflows with thirteen new date based rules. Each rule is based on a specific date field such as a customer’s last order date, an order’s creation date or a subscription’s next payment date. Every rule has several comparison options to choose from such as is in the last X days, is not in the last X hours, is after a date or is in a date range. These rules build on the existing rules system and can therefore be used in combination with the 70+ rules already included in AutomateWoo. View the documentation for more info on date rules. 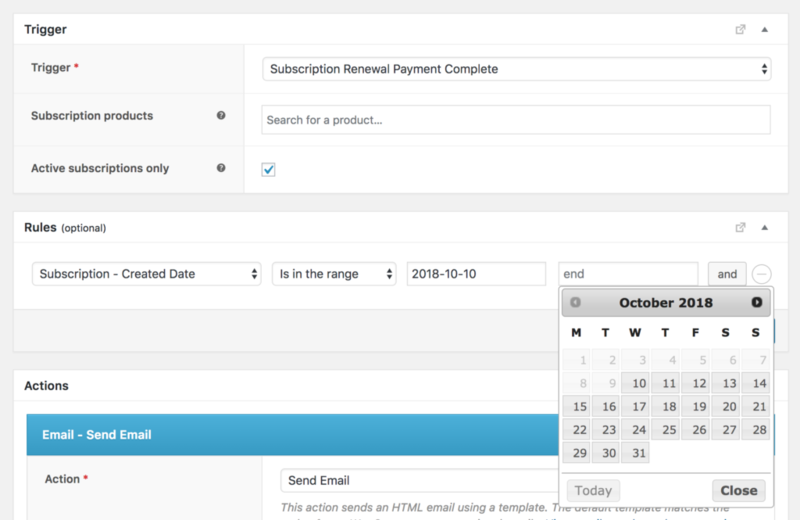 For stores using WooCommerce Subscriptions, AutomateWoo 4.4 adds the ability to add and remove subscription products and coupons via automated workflows. This makes it possible to create advanced subscription lifecycle systems that would normally require custom development. For more info please refer the documentation on Subscription – Add / Remove Product Actions and Subscription – Add / Remove Coupon Actions. AutomateWoo 4.4 drops support for WooCommerce 2.6 making the minimum required version 3.0. In version 3.0, the WooCommerce codebase was significantly changed (we think for the better) which required extensions to add a large amount of compatibility code in order to support both newer and older versions. WooCommerce 3.0 was released over 18 months ago and our reports show that only 4% of sites using AutomateWoo are running WooCommerce 2.6. By removing support for WooCommerce 2.6 we will be able to develop new features faster simply because there will be much less code to write. We also expect there will be significant performance benefit as we remove legacy code and utilize the new APIs in WooCommerce core. As this is a large plugin update, we recommend you test and/or monitor any workflows that are critical to your store after updating. For the full list of changes in AutomateWoo 4.4 please refer to the changelog. If you think you’ve found a bug, don’t hesitate to get in touch. If you are running any custom code for AutomateWoo we highly recommend testing that your code still behaves as expected after updating. Did you know you can install AutomateWoo on a testing site without it counting to your activation limit? In other news, we launched an ideas board where you can request and vote on the features you want added to AutomateWoo and Refer a Friend. Votes are going to heavily influence what features we work on going forward. The top request at the moment is for a Customer Birthday Trigger. The ideas board is also a great way to discuss how a feature should actually work and you can even get notified when a feature you need is completed! 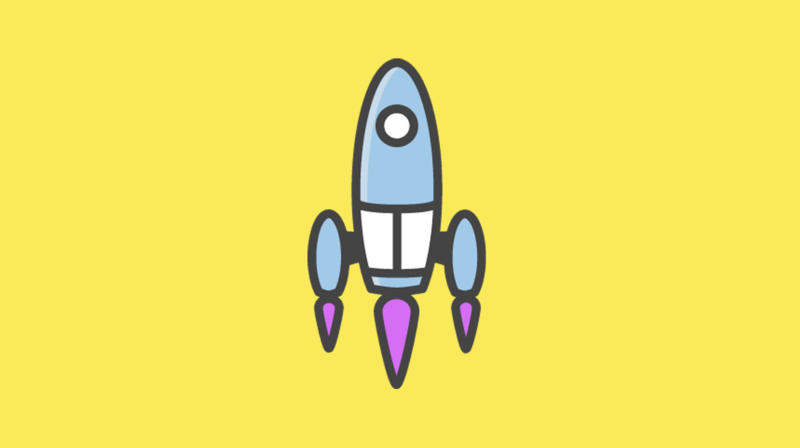 In case you missed it, earlier this month we started selling AutomateWoo as a yearly subscription with the aim making it easier to manage your AutomateWoo.com licenses. It’s now possible to set your licenses to renew automatically rather than go through the checkout process to renew. You can also now upgrade and downgrade your licenses from the account area. The terms of existing active licenses have not changed! Automatic renewal has been disabled for licenses created before November 2018 to match the previous license system. They will also continue to receive the 25% renewal discount, for life, regardless of whether auto renew is enabled or disabled. You can learn more about this in the new docs for account management. Thank you for using AutomateWoo!